Our newest line of Hawaiian Hibiscus Print Bags truly capture the spirit of our islands. This popular print makes these bags a must have for your endless summer! Make sure you have all your beauty essentials with our stylish Hibiscus Red Cosmetic Bag. 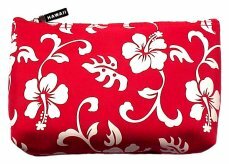 Made from high quality nylon, bag is fully lined with a Hawaii accent zipper closure. Available in Hibiscus Red and Hibiscus Navy. Designed in Hawaii.